14K Solid Gold Bible Verse Ring. 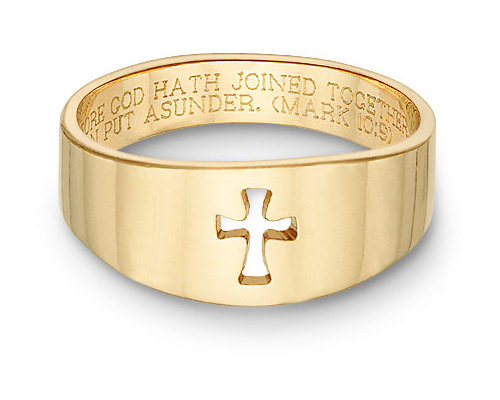 Customize your ring with any Scripture of your choice, up to 200 characters (including spaces). A daily reminder of your commitment to each other and to Jesus Christ, our Lord. Perfect as promise rings, wedding bands, or stand alone rings. Width: 8mm at top, tapers to 6mm at sides and 4mm width at bottom. Also available in 14k white gold, displayed below. We guarantee our Romanesque Cross Bible Verse Ring to be high quality, authentic jewelry, as described above.